Ya know what...you can hate all ya want...but I like this one. 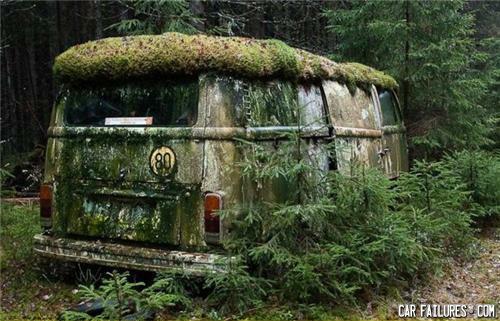 I like the way the colours of the shrubbery and the moss growing on the van make the van look like a natural part of the landscape, like it's just another plant. Nature reclaiming modern ruins has always fascinated me. It was gonna be used for touring on Jurassic Park but, we know how that ended. How can they see me? Seed your Minibus! SEED IT!